Now that Pinoyguy’s second letter continues to make noise mentioning some native English speakers reacting negatively about the post, there is this guy who defended “us” and gave an explanation as to why shooting down Filipinos dream of haggling for an increase should be done in its careful manner. And now the letter below. At the risk of adding fuel to the fire for those that like to shoot down the Filipinos (or other NNES) teaching staff – be careful. They get hired simply because they can speak English better than the Thai staff at the school who hired them or they get hired by dodgy agencies over the next candidate who is qualified simply because they are cheaper but the agencies hire them and pass them off as “English teachers” anyway. To those unqualified teachers… whatever your passport color, whether you are paid 30k for your “correct passport” or 15k for your lack of one, you are overpaid and have no business near a classroom. To those qualified teachers with teaching qualifications, teaching licenses, 750-990 TOEIC scores, etc) – you should be paid better. 15,000 is too low (unless benefits like housing, significant vacation time (with pay) and bonuses are added onto that). Judging from the author’s name, he or she is a native English speaker. Whoever you are (native or not), you made your case clear. I must admit I enjoyed reading your post not because it’s more like on our side, but more so, because it’s real. 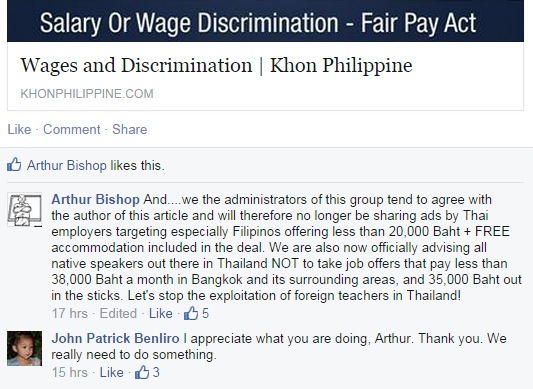 And by the way, after I post the link about “Wages and Discrimination” on Teaching Jobs in Thailand Facebook group, one of the admins left this comment. His move isn’t so big and may just be ignored by employers. But hey, it will surely make a difference. Thank you, Mr. Bishop. Together we stand, divided we fall. And now is the start.